Decoration 5 miniatures in colours and gold, at the beginning of the Hours of the Virgin (ff. 1r, 32r, 39r, 43v, 47v), with 2 miniatures missing at the beginning of Vespers and Compline (after ff. 50v, 59v). 84 historiated initials in colours and gold with marginal extensions, at the beginning of all major sections of the text. 8 foliate initials with marginal extensions in colours and gold (ff. 22r, 38v, 39v, 44r, 48r, 64v, 94v, 96v). Verse initials alternately in blue and gold with red or blue pen-flourishing. Line endings in blue and red, occasionally in gold. Bas-de-page pen-flourished decoration in blue, red and gold, with animal motifs, e.g., a fish (f. 8v) or a dragon (f. 11). Binding Pre-1600. 15th century beech boards with pink sheep-skin covering. Provenance William de Brailes (fl. c. 1230 - c. 1260), illuminator documented in Oxford between 1238 and 1252 in relation to several property transactions and as owning a house on Catte Street (see Donovan, The de Brailes Hours (1991), Appendix 5), illuminated by him: his signatures: 'W. de Brailes qui me depeint.' (ff. 43 and 47), made presumably for a woman: includes four images of a woman in prayer (ff. 64v, 75r, 87v, 88). Added prayers in Anglo-Norman French including prayers for friars Richard of Newark (Nottinghamshire), Richard of Westey, and Bartholomew of Grimston (d. c. 1265; joined the Dominican order in c. 1240, probably at Cambridge, see Hinnebusch, The Early English Friars Preachers (1951), p. 262, and Forte, 'A Cambridge Dominican Collector of Exempla in the Thirteenth Century' (1958), pp. 138-39), mid-13th century (f. 102v). Jacques Rosenthal (b. 1854, d. 1937), bookseller of Munich: sold to Dyson Perrins in 1906. Charles William Dyson Perrins (b. 1864, d. 1958), book and porcelain collector and benefactor: his bookplate (f. I recto); former shelfmark: Dyson Perrins MS 4. Included in a group of 8 illuminated manuscripts offered by the trustees of the Dyson Perrins estate to the British Museum at below market value; purchased with the help of the Friends of the National Libraries, the National Art-Collections Fund, the Pilgrim Trust and the National Treasury in 1959. The earliest extant English book of hours. Most miniatures and initials are accompanied by captions in Anglo-Norman French explaining their contents. The binding of the manuscript was formerly thought to be Italian of the 15th century. Pollard, 'The Construction of English Twelfth-Century Bindings', The Library, 5th ser., xvii, 1962, p. 3 and note, states that it is English work strictly contemporary with the manuscript. It consists of beech-boards covered with pink sheep-skin, originally stained puce. Spine and tailband missing. There were once five metal bosses on each cover, and a silk strap with a pin fastening. A star-shaped silver nail remains in the fragment of the strap. The manuscript was heavily cropped before binding. 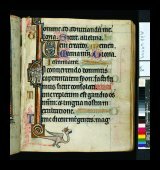 Select bibliography George F. Warner Descriptive Catalogue of Illuminated Manuscripts in the Library of C.W. Perrins (Oxford, 1920), pp. 11-25. Sydney C. Cockerell, The Work of W. de Brailes, an English illuminator of the thirteenth century (Roxburghe Club, 1930). Alfred C. Fryer, 'Theophilus the Penitent as Represented in Art.' Archaeological Journal , 92 (1935), pp. 295, 307, 319. Graham Pollard, 'William de Brailes', Bodleian Library Record 5 (1955). Stephen Forte, 'A Cambridge Dominican Collector of Exempla in the Thirteenth Century', Archivum Fratrum Praedicatorum, 28 (1958), 115-48 (pp. 138-39). Graham Pollard, 'The Construction of English Twelfth-Century Bindings', The Library 5th series, 17 (1962), pp. 13-14. [Derek Howard Turner], Reproductions from Illuminated Manuscripts, Series 5 (London: British Museum, 1965), no. 8. Illuminated Manuscripts Exhibited in the Grenville Library (London, British Museum, 1967), no. 14. Janet Backhouse, The Illuminated Manuscript (Oxford: Phaidon, 1979), pl. 27. Nigel Morgan, 'Notes on the Post-Conquest Calendar, Litany and Martyrology of the Cathedral Priory of Winchester with a Consideration of Winchester Diocese Calendars of the Pre-Sarum period', in The Vanishing Past: Medieval Studies Presented to Chrisopher Hohler, ed. by Alan Borg and Andrew Martindale (Oxford: B. A. R., 1981), pp. 133-74. Nigel Morgan, Early Gothic Manuscripts I, 1190-1250, 2 vols, Survey of Manuscripts Illuminated in the British Isles, (Harvey Miller: London, 1982), I, no. 73. Janet Backhouse, Books of Hours (London: British Library, 1985), fig. 39. Claire Donovan, 'The Mise-en-page of Early Books of Hours in England', in Medieval Book Production: Assessing the Evidence, ed. by Linda L. Brownrigg (Los Altos Hills, California: Anderson-Lovelace, 1990), pp. 147-62, fig. 1. Claire Donovan, The de Brailes Hours: Shaping the Book of Hours in Thirteenth-Century Oxford (London, British Library, 1991), p. 203 no. 20. Jonathan J. G. Alexander, Medieval Illuminators and their Methods of Work (New Haven: Yale University Press, 1992), p. 29, fig. 37. Michael Camille, ‘An Oxford University Textbook illuminated by William de Brailes,’ The Burlington Magazine, 137 (1995), 292-99. Janet Backhouse, The Illuminated Page: Ten Centuries of Manuscript Painting in The British Library (London: British Library, 1997), pl. 55. Peter Kidd, Illuminated Manuscripts (London: Sam Fogg, 1999), p. 8 [sale catalogue]. Ruth Dean and Maureen Bolton, Anglo-Norman Literature, A Guide to Texts and Manuscripts (London: Anglo-Norman Text Society, 1999), nos. 740, 830. The British Library Catalogue of Additions to the Manuscripts, 1956-1965, Part 1: Descriptions (London: The British Library, 2000), pp. 174-75. Nigel Morgan, ‘The Decorative Ornament of the Text and Page in Thirteenth-century England: Initials, Border Extensions and Line Fillers’, in Decoration and Illustration in Medieval English Manuscripts, English Manuscript Studies 1100-1700, 10 (London: British Library, 2002), pp. 1-33 (p. 13). C. M. Kauffmann, Biblical Imagery in Medieval England 700-1500 (London: Harvey Miller, 2003), fig. 116. Paul Binski, Becket’s Crown: Art and Imagination in Gothic England 1170-1300 (New Haven: Yale University Press, 2004), pl. 114, 151. Eamon Duffy, Marking the Hours: English People and Their Prayers 1240-1570 (New Haven: Yale, 2006), p. 8, pl. 2. Peter Kidd, 'A Franciscan Bible Illuminated in the Styule of William de Brailes', Electonic British Library Journal, 2007, article 8 http://www.bl.uk/eblj/2007articles/article8.html [accessed 6 August 2008]. Deirdre Jackson, 'The Influence of the Theophilus Legend: An Overlooked Miniature in Alfonso X's Cantigas de Santa Maria and its Wider Context', in Under the Influence: The Concept of Influence and the Study of Illuminated Manuscripts, ed. by John Lowden and Alixe Bovey (Turnhout: Brepols, 2007), pp. 75-87 (p. 79, fig. 2). Margaret Scott, Medieval Dress & Fashion (London: British Library, 2007), pl. 35. Anthony Bale, Feeling Persecuted: Christians, Jews and Images of Violence in the Middle Ages (London: Reaktion, 2010), p. 216. Adrienne Williams Boyarin, Miracles of the Virgin in Medieval England: Law and Jewishness in Marian Legends (Cambridge: D.S. Brewer, 2010), pp. 75-81, 114, 195. Aden Kumler, Translating Truth: Ambitious Images and Religious Knowledge in Late Medieval France and England (New Haven: Yale University Press, 2011), pp. 110 (fig. 29), 111, 255 (n.28).